Whether you want to purchase a new construction home in New Castle County, Delaware, for an easy commute over to Philadelphia, in Kent County, Delaware, to be near our capitol of Dover, or in Sussex County, Delaware, to take advantage of the beaches, not to mention the lowest property taxes of the three counties, I'll guide you to the newly built home of your dreams. Because I specialize in new construction, I keep an extensive file on every new home development in the area. Currently I have over 200 brochures, including at least one from every builder in every new community. So before you spend hours, days, and weeks driving around to visit builders and view model homes, text me, e-mail me, or call me at 302-494-8100 to set a time to view those files. You'll narrow your search by seeing photos of builder's model homes and learning details such as pricing, floor plans, homeowners' association fees and the covenants, conditions, and restrictions of each subdivision. There's no need for you to waste time by looking at homes you'd never consider because I can introduce you to those that meet your specifications. Because I'm a member of the Delaware Home Builder's Association and stay in close contact with all of Delaware's major home builders, developers and Land Use decision makers, I can also offer you the benefit of "inside information". For instance, if you're an investor thinking of buying now and moving in later, I can show you which builders' model homes are available for sale with an agreement from the builder to lease the home back for a period of 1 or 2 years. Builders are great tenants because they continue to use the homes for models, and thus keep them in prime condition. 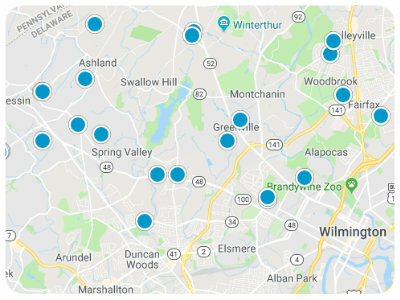 If you prefer a new home, but need to move soon, I can connect you with Delaware builders who have "Quick Deliveries" - homes available for immediate sale and occupancy. If you like a particular builder's floor plan but not their location, you can get exactly what you want by having one of the custom builders recreate the home with some minor adjustments. They'll avoid patent infringements and you'll get your dream home on you dream lot!! Text me, e-mail me, or call me at 302-494-8100 today to see how I can simplify your Delaware house hunting adventure and assist you in obtaining the home of your dreams. After having sold over 100 new construction homes in the past few years, I can alert you to costs that some builders don't reveal until you've committed to the purchase. From additional closing costs to impact fees and front foot assessments, these costs can easily add thousands to your purchase price. With me at your side, you'll be an educated and informed buyer – which puts you in a far better negotiating position. Even though I'll be saving you time, trouble, and money, my Buyer's Agent services are free to you, the prospective buyer! There are no hidden charges or obligations. How is this accomplished? Just as an individual homeowner signs a listing agreement, these builders have negotiated co-broker and listing agreements that take care of all Realtor fees. With me as your Realtor, you have everything to gain and nothing to lose! You'll also get an insider advantage when it comes to financing your purchase. Before I became fascinated with new construction, I spent 8 years in mortgage lending, so I can help you connect with reputable lenders and help you wade through all the paperwork required for a construction loan. So, you've found the location, selected your floor plan, made decisions on all the options, agreed on a completion date, secured your construction financing, and signed the purchase agreement. Now what? Now you wait for the house to be built and be ready for occupancy. At this point, most agents will thank you for your business and leave you on your own. But I don't work that way because your joy and your satisfaction on a move-in day are important to me. That's why my service to you continues throughout the construction process. During the six months or so between agreement and move-in, I'll remain by your side. I'll accompany you to construction meetings and pre-settlement meetings – or attend in your place when you can't be there. I'll also stop by your project every few days – because mistakes do happen and when they're not caught in time, they cause expensive delays.